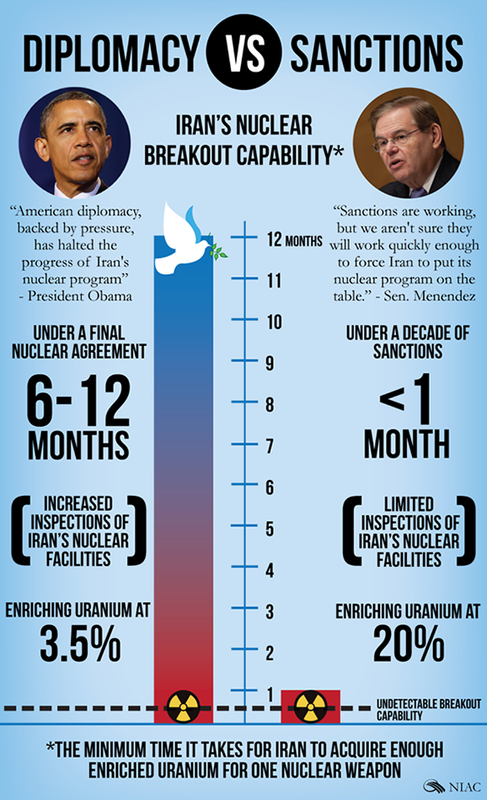 Whenever the topic of negotiations with Iran comes up, the word “breakout” isn’t far behind. But what is “breakout,” and why is it so important? Breakout time estimates are both a barometer of the time it would take for Iran to build a nuclear weapon and an indication of diplomatic progress to prevent that possibility. Among the crucial stages in creating fuel for a nuclear bomb are uranium enrichment, and the preparation and installation of centrifuges. Both of these processes are also part of civilian nuclear programs. Iran is already able to enrich uranium at two of its facilities (Fordow and Natanz); the interim “Joint Plan of Action (JPA)” deal between Iran and the P5+1 countries requires Iran not to enrich any uranium to weapons-grade levels, and to eliminate its existing stockpile of near-weapons-grade enriched uranium. The agreement also requires that Iran install no new centrifuges, nor prepare any new centrifuges for installation. Essentially, the goal is to limit Iran’s technical capacity in such a way that the international community can be absolutely sure that any nuclear program is not a military threat. So, how big a window do we need? To be credible and justify significant sanctions relief, any long-term deal would need to ensure that Iran’s centrifuge capacity is highly limited and that these limits will further increase breakout times, preferably toward six months. When testifying before the Senate Foreign Relations Committee recently, Secretary of State John Kerry indicated an even bigger breakout window: Asked about negotiators’ goals for a long-term agreement, he said “six months to 12 months is - I'm not saying that's what we'd settle for, but even that is significantly more." How do we assess breakout capacity? Expert analyses have been based on technical information gleaned from national intelligence reports and international inspections to date. The US intelligence community reaffirmed in 2011 that Iran’s leaders have not made a decision to build a nuclear bomb. The interim deal currently in place requires that Iran’s nuclear facilities be open to daily inspections by the International Atomic Energy Agency (IAEA), in order to provide the transparency necessary to ensure that the agreement’s conditions are met. So far, the IAEA has repeatedly reported that Iran is in compliance with the interim agreement. Experts agree that Iran’s elimination of its existing near-weapons-grade enriched uranium (in keeping with the interim deal) has already lengthened the breakout timeframe, from three to four weeks to nearly two months. But most in the international expert community agree that even more information will be necessary to make a deal. The challenge for these negotiations is to define an acceptable Iranian civilian nuclear program that will never build a nuclear bomb. Breakout times are the lynchpin to this negotiation, because if Iran were to change course and seek to breakout to build a nuclear weapon, there should be a long enough breakout time so that its efforts would be detected with sufficient time to marshal a strong response… which is why extending the length of breakout times is so significant. To get there, it is crucial that any long-term agreement include an agreed-upon breakout time. With that in place, if Iran’s leaders ever begin to shift the country’s civilian program to a weapons program, the West will have enough time to act.